The streets are crowded with motorbikes moving at all different speeds, in both directions. It seems a major challenge for a walker. But one quickly learns that motorbike drivers will weave expertly around walkers. There is, in fact, some order to the seeming chaos of the streets. Vietnam is the land of the motorbike. Last year, Google Maps even created a feature for two-wheel commuters in the country. It provides trip times and road costs just for motorbikes. So can Vietnam's two biggest cities really ban the transport that its 100 million people depend on every day? City officials have proposed a motorbike ban in parts of Hanoi and Ho Chi Minh City. It is not the first time such an idea has been suggested. Similar proposals have come up over the years. The idea has led to a debate about pollution, traffic problems, city planning, and the fairest way to get people where they need to go. Supporters of motorbike restrictions argue that they are needed to cut pollution and traffic. But opponents say the public has no alternative. Cars, they say, are too costly and public transportation is limited. Nguyen Ngoc Dong leads the country’s Ministry of Transport. Vietnam’s official newspaper reports he said, "Hanoi is just now in the process of developing the idea. There are still a lot of issues that need to be researched, assessed, and analyzed before making a final plan." The idea is to ban motorbikes during the busiest parts of the day, or in the busiest parts of the city. Ho Chi Minh City’s population has now grown to 13 million. Its air quality is worsening. Pollution levels sometimes go beyond those in China and India. Supporters of a ban say if other countries can do it, so can Vietnam. Crowded cities from Beijing to Mexico City have in place restrictions on car use. Some cities, like Stockholm, have barred vehicles from pedestrian zones. Unlike those places, however, Vietnamese cities do not have enough public transportation to replace motorbikes. Projects to build subway systems have been delayed repeatedly. Commuters do not want to take buses when motorbikes are faster and more convenient, and still low cost. Vespa maker Piaggio Vietnam said a motorbike ban could push people to use cars, which would not help solve the pollution and traffic problems. "We believe that to meet those objectives, simply banning motorbikes is a radical and not effective solution," Enrico Bruni, the company's head of finance for Asia, said at a business conference last month. He suggested it would be better to try to educate the public about traffic problems. He said the government should also place controls on vehicle pollution. Others suggest that Vietnamese officials should try to experiment with ways to redirect traffic, including the use of sensors to measure traffic to permit the rerouting of drivers. Some Vietnamese are old enough to remember a time when they would have been lucky to own a bicycle. But today almost everyone has enough money for a motorbike, which costs as little as a few hundred dollars. 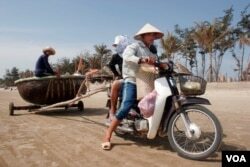 Vietnam is the fourth biggest market for motorbikes in the world. The top three, China, India, and Indonesia, each have populations at least double that of Vietnam. An outright ban of motorbikes seems unlikely if not impossible. The vehicle is deeply embedded in Vietnamese urban life. It is hard to find a picture of a Vietnamese city that does not include a motorbike or two. It is common to see a family of five riding together on the two-wheeled vehicles. People transport everything from giant pigs to dining tables on their motorbikes. War veterans turn their motorbikes into taxis. And visitors jump on the back of motorbikes for guided food tours of the cities. Critics say a motorbike ban would hurt the poor, who depend on motorbikes, more than the wealthy, who favor cars. That is not to say some restrictions do not work. Ho Chi Minh City started limiting motorbikes on the downtown street of Nguyen Hue several years ago. Its residents have since enjoyed walking the street, turning it into a popular public space. Ha Nguyen reported this story for VOA News. Caty Weaver adapted the story for Learning English. Hai Do was the editor.